I suspect that Mr Coldrey over at Full Pour will be reviewing this wine tonight too, for we both agreed how good this looked. Exciting even. Apparently it’s a solid two years off commercial release, but gee, queue up for it when it does. It’s That Good. From first whiff, from the first little waft to escape the glass this smells good. Very good. Very authentic, serious, and unmistakeably Pinoty. It even looks serious, with a murky, cloudy red appearance that looks almost mystical. 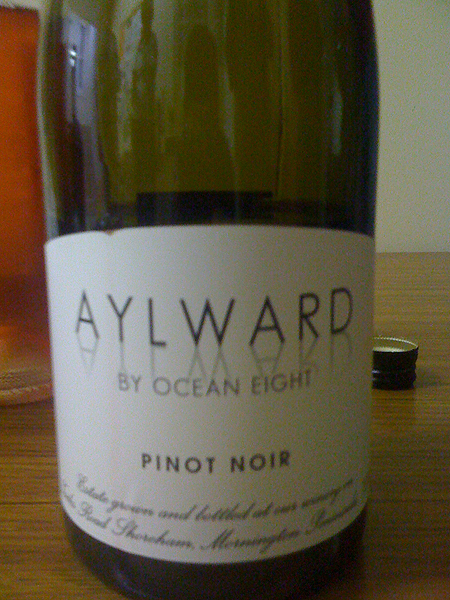 On the nose it’s all black pepper, sappy deepish red fruit, with a real animale unfiltered stink. A proper Pinot stink that one. On the palate too there is a gamey edge too the firm, muscular palate that is raunchy and wild, a real ‘take it or leave it’ firmness that is oh so classical Pinot. It’s just a little stunted on the finish, which is not surprising given it was only bottled recently, but I’ve got no doubt it should all fill out by the time it is released.